Actually, scanning capabilities regarding certain file types is a common end-user misconception, virustotal will scan any binary content, with independence of its file type, as antivirus vendors will develop signatures for any file type and target OS with independence of the OS that hosts the engines running in virustotal. This said, two weeks ago we silently introduced a new tool to further characterize Mac OS X executables and iOS apps, extracting interesting static properties from these types of files, similar to what the pefile python module does for Portable Executables. The new tool will extract file header information (e.g. required architecture and sub-architecture, flags, magic string, etc. ), the file segments and its inner sections, any shared libraries that the executable makes use of, load commands and signature information whenever the mach-o happens to be code signed. In the event that the Mac OS X executable is a universal binary containing mach-o files for several target systems, a characterization of each one of the embedded files will be provided. You may refer to the file details tab of the above reports in order to see an example of this new set of information. 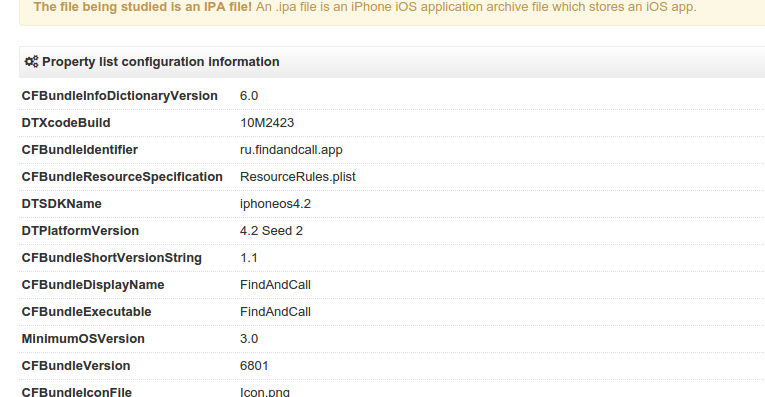 As to iOS apps, the new tool will not only characterize the executable providing the application's main functionality, it will also generate metadata regarding the package itself (property list configuration information and embedded mobile provision data) and iTunes details. As you may notice, this tool follows the trend of what we recently implemented regarding ELF files, hopefully it will also help in spotting and studying threats targeting Mac OS X and iOS. """ALYac provides differentiated service with the award winning Triple-Engines. The ESTsoft's Tera Engine, the BitDefender Engine and the Sophos Engine establish several protection layers. With the lightweighted engine and the memory optimization, ALYac minimizes its resource usage. Moreover, ALYac boasts excellent detection power against variant malicious files through 'Smart Scan Technology'.""" Blueliv is a leading provider of cyber threat information and analysis intelligence for large enterprises, service providers, and security vendors. The company’s deep expertise, data sources, and cloud-based platform address a comprehensive range of cyber threats to turn global threat data into real-time actionable intelligence specifically for each client in an easy-to-use dashboard. Blueliv’s clients include leading bank, insurance, telecom, utility, and retail enterprises. Hopefully this integration will lead to increased knowledge about threats and will help protect users world-wide. In computing, the Executable and Linkable Format (ELF, formerly called Extensible Linking Format) is a common standard file format for executables, object code, shared libraries, and core dumps. It was chosen as the standard binary file format for Unix and Unix-like systems [Wikipedia]. Even though the popularity of the Windows OS among average end-user systems has meant that attackers have mostly focused on developing malware for Windows systems, ELF badness is a growing concern. The colleagues over at Malware Must Die are making a huge effort to put some focus on ELF malware, their article entitled China ELF botnet malware infection & distribution scheme unleashed is just an example. Hopefully all this new information will bring some attention to malware targeting linux systems and will lead to better world-wide defenses against these threats. We keep increasing the number of engines integrated in virustotal's URL scanning backbone. Today is the turn of OpenPhish. OpenPhish is a service developed by FraudSense, whose engine was integrated a couple of weeks ago, that serves as a free repository of phishing sites detected with FraudSense's Phishing Detection Technology. OpenPhish is a free service that provides a continuously updated feed of global phishing URLs that were detected by FraudSense's Phishing Detection Technology. The feed includes phishing sites from the past 7 days and is updated in real time with newly detected ones. Hopefully this new addition will beef up virustotal's detection capabilities when it comes to phishing sites, which even though is an old scam, it is still very extended and a common threat for the average Internet user. “The antivirus AVware is developed in Brazil with focus on regional threats. Systems administrators, engineers and security analysts often use GNU/Linux, Mac OS, or BSD. The VirusTotal uploader can be compiled and distributed on these systems. This will give users the 2nd opinion that that VirusTotal can offer and should make queueing scans on VirusTotal easier. QT Version 5 or newer development packages. Most linux distributions have this already. C Interface to VirusTotal API which we recently open-sourced. To compile on Mac OS X, you will need xcode development tools. Drag and drop a file to the VirusTotal Uploader in order to scan it with over 50 antivirus solutions. Allow you to "Open With" in a file browser to scan a file. If anyone wishes to send patches, please do a pull request to us on github. Comments and suggestions are welcome. We are mainly blacklisting websites that are tricking users into completing offers by advertising content that is very desirable but the website doesn't actually have the content and it is just to make the end user complete an offer. From our intense research, these kind of websites are not getting enough attention in terms of blacklisting and we are the only website to offer such a blacklist for these kind of websites but we believe it is in the best interests of all internet users to have these kind of websites blacklisted. We are also blacklisting other abusive websites including phishing and other kinds of scams. Based on cognitive concepts, artificial intelligence and active learning, our innovative technology automates what has traditionally been a labor-intensive process and enables real-time detection of phishing sites and their targeted brands. 0-Day Phishing Detection: Early discovery of new, unreported phishing sites.Brand Recognition: Accurate identification of the targeted brand.Language-Independent: Detection of both English and non-English phishing sites.Self-Sufficient: Independent of community-sponsored blacklists. FraudSense is exposing its phishing feed to VirusTotal, so that users can check whether a given URL is already in their blacklist and hopefully get yet one more second opinion that will help them in keeping their environments safe. Many users interact programmatically with VirusTotal via its public API, it is an easy HTTP+JSON interface that allows you to easily submit and check files in order to help improve security world-wide. Moreover, many VirusTotal Community volunteers have very kindly implemented the API in a wide variety of programming languages, some of these implementations are documented here, many others exist and we will progressively adding all those that we are made aware of. This said, there was not any full implementation of the API in the C language, so that any C or C++ program that users might be building could easily interact with VirusTotal, at least we were not aware of any. We have released a VirusTotal interface written in C to our API on github at https://github.com/VirusTotal/c-vtapi, any C or C++ program should be able to use it. Its goal is to implement all of the public API and private API features in C. The public API features will work for anyone with a free public API key, the private API features will only work for those who have licensed our services and use a private API key. The recently announced VirusTotal Uploader for OS X internally uses the c-vtapi project. Using C it is a common building block that other programs or languages can interface to. Better windows support and testing. We have tested a lot with OS X and linux, the windows scaffolding is there, but is not well tested. More example programs or command line utilities that use this C API interface. For example, we know Sebastian Poeplau, being a busy guy, was looking for collaborators that would implement VirusTotal submissions in his awesome Ghost USB project, perhaps this C implementation makes it easier to perform the integration and some volunteers stand up. Adobe Flash is present on nearly every PC, thus, malware authors have been increasingly targeting it over the last years, following the principle of return on investment, i.e. they will focus on popular technologies to exploit as that will eventually mean a larger base of compromised machines. The rich ActionScript features that are available in Flash also led to these files being commonly abused in multi-stage web-based attacks, using them as a vehicle to perform heap-spraying, JIT spraying and other badness. Just recently FireEye discovered a new Zero-Day targeting Internet Explorer that used a well-known flash exploitation technique to achieve arbitrary memory access and bypass Windows’ ASLR and DEP protections. In trying to find SWF samples from this attack across our entire collection we realized that, while we produce very rich information for most commonly abused file types (behavioural reports, Androguard Android static information, RTF maliciousness signals, etc. ), we did not have any file characterization tool specifically focusing on SWF files. Remember that VirusTotal is not only a multi-antivirus, it also runs many other tools on files. We have built a very simple tool which we call swfknife in order to extract certain interesting properties from flash files. In addition to this, the tool also produces a feature hash that can be used in VirusTotal Intelligence in order to search for similar SWF files and cluster these together, just as you can do right now with PEs, MS Office files, RTFs and PDFs. Whether the file fingerprints the OS executing it. The use of the loadBytes function in order to load other SWF files or custom code at runtime. Whether the file has been encrypted/obfuscated with common SWF packing tools. Whether the file contains long strings of hex characters, very often revealing encoded malicious code that gets decoded with hexToBin and loaded at runtime. Indicators revealing that the file is performing heap spraying. Whether it contains code identifying the environment executing it, e.g. the flash player and version. Whether it uses the ExternalInterface class to communicate with the external host of the Flash plugin, such as the web browser, commonly used in multi-stage attacks where the browser gets redirected, injected with an iframe or some other badness. The presence of iframe injecting code, or iframe tag references. The use of the fscommand function to save or execute other files. Whether the file embeds other file types such as Portable Executables, RARs or ZIPs. It will also print out any iframe patterns and suspicious URLs the file might contain. Additionally the tool will extract other flash properties such as the number of flash tags it contains, the frame size, the compression used, etc. Hopefully all of the extracted characteristics can be used by researchers as signals in order to improve their file scoring mechanisms, will enhance Intelligence's searching capabilities for flash files and will help track campaigns pertaining to the same groups of attackers. In coming up with this new information we found Timon Van Overveldt, Christopher Kruegel, and Giovanni Vigna's paper entitled FlashDetect: ActionScript 3 malware detection very useful and inspiring. VirusTotal Uploader is a popular utility in the tool-set of many malware fighters, it eases the task of submitting files to VirusTotal using Windows operating systems by just performing a right click on any file and selecting the pertinent option from the context menu. Over the years the Windows Uploader evolved, being able to also quickly scan the image files of running processes, trigger scans of remote URL content before saving it to disk, etc. Even some community members produced similar utilities, many of which outperform our very own software, an example of this is Phrozensoft's VirusTotal uploader. That is the magic of building a community of passionate researchers, they will use your APIs in order to produce better tools that will benefit end-users world-wide. Today we are proud to announce a new VirusTotal Uploader for OS X. It is available for download on our Desktop Applications page. Internally it uses our public API to schedule uploads of files, with the exact same limitations that any public API user would experience. Drag and drop a folder to the VirusTotal Uploader and schedule the analysis of its content. 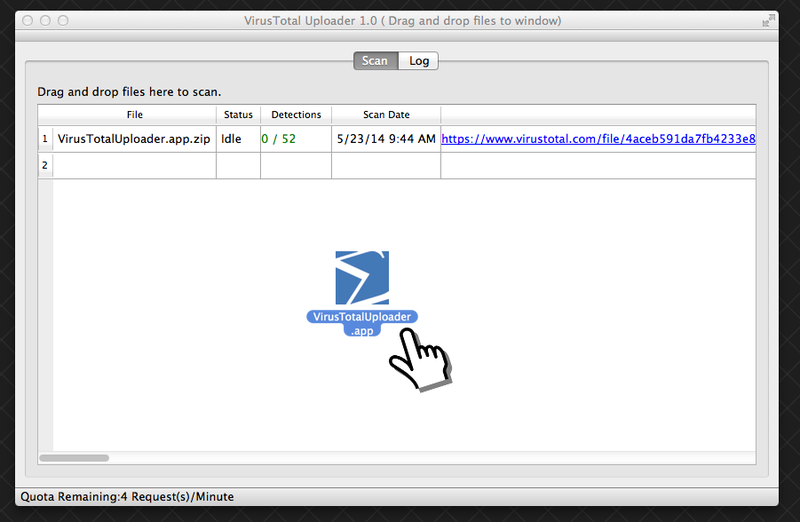 Drag and drop a Mac application to the VirusTotal Uploader. Allow you to "Open With" in finder the VirusTotal Uploader to scan a file. Hopefully this will lead to VirusTotal receiving more Mac applications, diving deeper into an increasingly targeted OS by attackers and allowing antivirus companies and researchers making use of VirusTotal's back-end to build stronger defenses against these threats. It has been tested on OS X 10.8 and 10.9. Any bug reports, feedback or feature requests are welcome. Just recently my colleague Julio announced the introduction of Tencent as a new antivirus solution in VirusTotal's file scanner. Today we are excited to announce that Tencent has broadened its collaboration and is also sharing its malicious URL dataset in order to enhance our URL scanner. "Tencent anti-virus engine is an independent R&D anti-virus engine, which contains three technology-leading methods to detect malware. 1. TAV uses clustering to extract the micro-signature efficiently and make sure the detection of malware efficiency. TAV also has the powerful ability of processing infective virus. 2. QQsm is a new anti-virus engine which using machine learning methods to detect malware. There are massive confirmed malwares and safe file in out database and we use those to make the Mathematical model which has a great detection rate for new form malware. 3. TCloud is a cloud-based anti-engine, which has efficient response capability." We welcome Zillya as a new file scanning engine at VirusTotal. We observe malicious behavior to develop, understand, inform and fight against scourges. The laboratory actively fights against malware, spam and security risks. Among other projects, CRDF has built its own threat center and they are very active VirusTotal uploaders. Today we are excited to announce that they have taken this collaboration one step further and started sharing their malicious domains dataset with VirusTotal in order to make it work as a URL scanner. "AegisLab’s intelligent virus DNA algorithm extracts the special one-to-many mapping virus signatures. It achieved the much higher detection rate for latest Windows PE and Android APK variant virus. Their scan engine also uses the DNA fast match algorithm and is very suitable for limited resources environment. In native streaming mode, the engine is able to catch the most virus very efficiently from network packets." One unique way that Mandiant tracks specific threat groups' backdoors is to track portable executable (PE) imports. Imports are the functions that a piece of software (in this case, the backdoor) calls from other files (typically various DLLs that provide functionality to the Windows operating system). To track these imports, Mandiant creates a hash based on library/API names and their specific order within the executable. We refer to this convention as an "imphash" (for "import hash"). Because of the way a PE's import table is generated (and therefore how its imphash is calculated), we can use the imphash value to identify related malware samples. We can also use it to search for new, similar samples that the same threat group may have created and used. When considering an individual report, this property might not be very useful on its own, however, if you happen to have an API key with additional information privileges you will also find the hash embedded in the JSON response. This means you can massively feed your own local database setup with the imphash and implement your own similarity search feature for your malware collection. VirusTotal Intelligence users can already perform searches through our dataset according to this new property. "QVM is Qihoo 360’s proprietary technology that detects malware through an artificial-intelligence algorithm capable of machine learning to recognize new forms of malware. QVM technology offers a robust model for recognizing malware characteristics using the massive amount of data that we have compiled on confirmed malware in our blacklist and verified safe programs files in our whitelist. This model is used as a basis for a detection algorithm which is automatically enhanced and updated with new malware samples submitted by our users to our servers. Program files that do not appear in our blacklist and whitelist are scanned using QVM, and any ''hits'' returned by this technology are presumed to be malicious and removed or quarantined. As malware is constantly being created or morphing, QVM has the advantage of being able to detect threats that have not been previously identified. According to PC Security Labs, an independent security product test organization, QVM has a detection rate of 74.9% for unknown new malware, which surpasses most heuristic detection technologies."